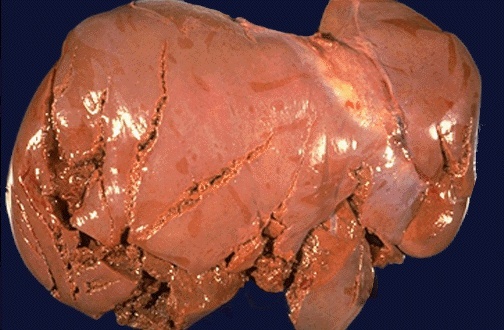 Massive abdominal blunt force injury often leads to liver injury, since it is the largest internal organ. Note the multiple lacerations seen here over the capsular surface of the liver. Damage to abdominal organs with lacerations, crush injuries, and rupture can lead to bleeding into the peritoneal cavity known as hemoperitoneum. A peritoneal lavage can detect such bleeding.